Submitted by daryl on Mon, 2008-02-25 21:34. 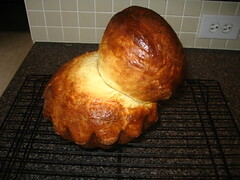 The Casatiello bread I made a week or so ago turned out wonderfully. It had a great texture, a nice yellow color inside, a crisp crust, and a very nice flavor. It was yummy on its own and also made great sandwiches. This weekend, I moved on to a brioche, which is very similar to the Casatiello but is often made in weird shapes, as depicted below. I bought a pan for the occasion. 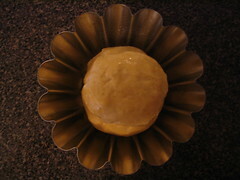 Basically, you get this special pan and stick a big ball of dough in it; then you stack a second ball on top of it. I think I made the top ball too large, and I must have distributed its mass unequally, as it shifted substantially during baking. 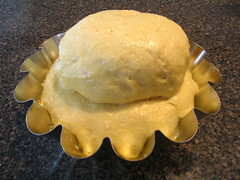 The next time I make it, I may do one ball in the fluted pan but skip the snowman look and use a regular bread pan for the remaining dough. The color of this bread is lovely, and it tastes great. I ate a bunch of it by itself today, but it also made a tasty roast beef sandwich of some leftovers from last night. Pictorial following. This is the initial batch of flour, milk, and yeast, which ferment for less than an hour to start pulling flavor out of the flour. Here I’ve added the rest of the ingredients (including a stick of butter, which accounts for the yellow color) and stuck in the fridge overnight. 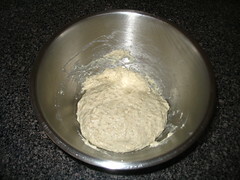 This is the view from above after forming the shape of the bread. Looks kind of like a flower. 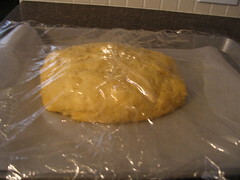 This is a better view of what the bread is likely to look like post-bake if all goes well. And here’s the final product. The top ball slipped over to the side, so it looks kind of weird. The ball in the picture in my book has slipped a little bit, but not nearly this much. The ball in the book is also much smaller, and I think the weight of the risen dough had something to do with the slipping. The bread is tasty, in any case! Submitted by DylanW on Thu, 2008-02-21 20:01. We (the programmers) recently (like two weeks ago) moved to a new set of cubicles. As it turns out, the cubicle that I selected is just under the security camera set up in front of one of our outside doors. We made jokes about it, but it was obviously pointing at the door, so in theory I was safe. Turns out that, to capture the door and the sidewalk leading up to it, the camera can also see pretty much my entire cubicle. And my cubicle is the only so affected. I'm already starting to feel like someone is watching me no matter where I go in the building. Within a few weeks I'm pretty sure I'm going to have to start wearing a tinfoil hat. Otherwise, I'm not going to be able to concentrate with that danged government talk playing through the radios the aliens implanted in my teeth. I hope our insurance has good coverage for mental health. Submitted by DylanW on Sun, 2008-02-17 17:17. "Cash Cow" is a song I haven't listened to for a while and forgot how good it was. Steve Taylor is one of those artists most people haven't heard of. Mostly because his work is all from the 80's, is satirical Christian rock, and will probably offend you if you're extremely conservative or liberal. The Noir soundtrack is one of the greatest anime soundtracks ever. I challenge someone to dispute this. "City Crusher" is one of the very few tracks I ever listen to off of the Nerdcore Compilation. There's a few good songs on there, but there's a lot that I either don't get, or just isn't my thing. Not that rap ever really was my thing. Submitted by DylanW on Sat, 2008-02-16 19:22. A story of people cracking stupid jokes at the wrong time. Warning: potentially offensive adult subject matter inside. Submitted by DylanW on Sun, 2008-02-10 10:40. OK, I'm going to give this meme another shot before completely giving up. Last week's episode has the complete rules, but the idea is to post a sampling of songs starting with the letter B in the comments thread, and comment on other choices. And here my weird combination of music that we like to call "wuss rock" (Christian rock--hopefully the non-crappy kind but that's subjective, geek rock, anime/Jpop) rears its ugly head. Hmm. Another thing I've noticed--doing the YouTube links (yet another part of the game I've swiped from Slacktivist) makes it really hard to find obscure songs (see previous definition of "wuss rock"), and it also proves that a lot of bands that sound good on CD really don't sound so great live. Submitted by DylanW on Mon, 2008-02-04 17:21. I had an interesting surprise today. For pretty much the entire day, I was unable to remote desktop into my computer at the house. Further investigation turned up that, even from my Linux box at the house, I couldn't even get a ping from my desktop. Hmm. So I booted it up after I got home, and after a while, it just shut off on me. Hmm. I opened it up and cleaned out all the dust I could without having any compressed air. It booted and ran for a while, but eventually stopped again. I should mention that both of these sudden shutdowns happened while I was in the process of writing my "Music Game" blog post. Dangit. The brief smell of smoke or burning or something hung in the air when I got home. The power supply also seems to be the warmest part of the computer after each shutdown. I'm thinking the issue is with the power supply fan--I'm not hearing or feeling it work after I boot up the computer. That would be all well and good since I could just change the power supply, except I have an HP with one of those screwy mini power supplies. Lovely. So I'm glad I never got that NAS, because it looks like I'm going to have to get me a new computer soon. Submitted by DylanW on Mon, 2008-02-04 16:15. OK, as I mentioned in my previous blog post, I'm going to give a blog game a shot. Here's the rules: I'll post a list of songs that begin with the specified letter ("A" and "the" don't count.) Other people can then add comments with their songs. (This game is best played with your iTunes/WMP/your music player of choice open in front of you.) In theory, people will eventually comment on everyone else's choices and we will have a discussion. In theory. Submitted by DylanW on Fri, 2008-02-01 15:32. I ran across a game on another blog which looks sort of cool. The idea is that each week, you take a letter of the alphabet, and then your host posts a sampling of songs from his playlist that start with that letter. Commenters add their own lists, thus discussion is born as everyone comments on everyone else's lists. Admittedly I have crappy taste in music. Still, pretty much everyone who regularly comments on my blog has different musical tastes, so it might be interesting. Or a flamewar. Anyway, it seems like a nifty idea to me, but I'm not going to start it if no one would post. Any takers? Submitted by DylanW on Fri, 2008-02-01 06:35. And I don't mean that in the depressing way, either. Not this time, at least. We had our final weigh in for IT Biggest Loser today. I started at 230 and ended up at 218. That's a loss of 12 pounds in 8 weeks. The sad (well, not really) news is that we're extending the competition to 6 months. That means I only win $100 for my win instead of $300. I kid that it's a sad thing--frankly, weight loss and fitness is a long-term thing, and considering that you should only lose 1-2 lbs per week, two months really isn't enough time for a good competition. Submitted by DylanW on Thu, 2008-01-31 20:57. I got a letter in the mail today from St. Jude inviting me to join a "Long Term Follow-Up Study." Basically, I fill out some release forms and they send me some questionnaires to complete about long-term side effects that may have been caused by my treatment. And for my trouble, they included a nice, crisp $2 bill. I have no idea why, but I find that bizarre. It's probably standard for these sort of studies and surveys and whatnot, though. I wish more of my mail came with free money. I'll have to put that with the $2 bills I got as change from some dealer at Anime Weekend Atlanta. Also, they keep calling the study "LTFU." I wish there was a "Short-Term Follow-Up Study." Heh.